Shortly after the close of New York Fashion Week, Coucou will host its very first fashion show! 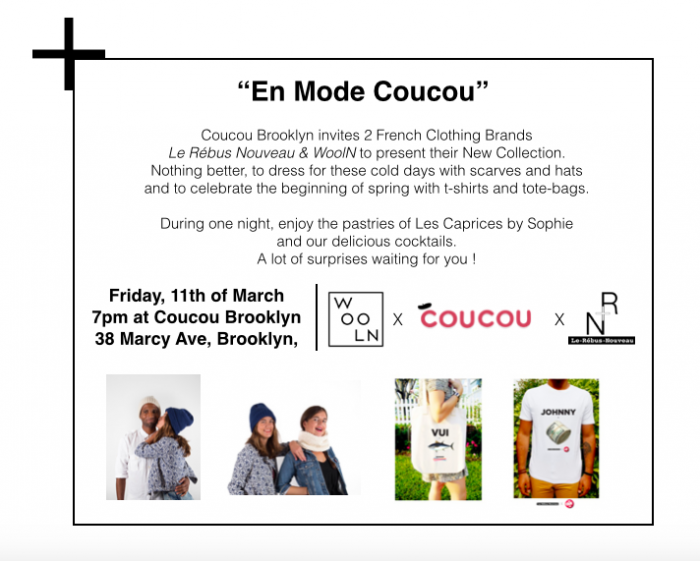 Join us on March 11th as we showcase the work of two up-and-coming New-York based, women-run French companies – Coucou’s favorite provider of fine knits Wooln, and cheeky T-shirt and tote bag designer Le Rébus Nouveau. The products will be modelled by fellow Coucou students and available for sale at preferential prices – there will even be a contest with prizes to be won! And as usual with Coucou events, fine wine, cocktails and French treats courtesy of Caprices by Sophie.